MG Motor, a British automotive brand, has appointed of Al Yousuf Motors as its UAE distributor. The news comes at an exciting time for customers of the brand, which earlier this year launched its stylish new MG RX5 and MG ZS SUVs in the Middle East, said a statement. 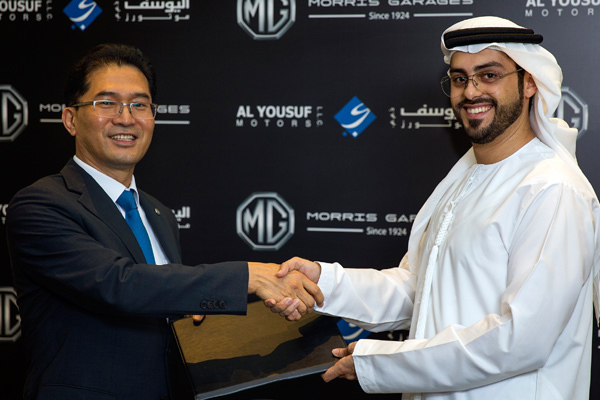 The agreement between MG’s parent company, SAIC Motor, and Al Yousuf Motors will see the UAE automotive services company, begin servicing MG’s customers with immediate effect. Operating from five locations across the UAE, they will introduce a fresh new line-up of models aimed at meeting the demands of today’s modern motorists, it said. Al Yousuf Motors will provide a range of services for new and existing customers of the rejuvenated MG brand, including new car sales, servicing, finance packages and leasing deals, it added. The line-up includes the new MG ZS and MG RX5 SUVs, as well as the MG 360 compact sedan, the new MG ZS’ expressive design language highlights the premium nature of the MG brand, and will feature across all upcoming models, including a brand-new model for the Middle East and the refreshed GS model, which will be introduced to the region later this year. “We are experiencing positive growth globally and view the Middle East as a very important market. Together with Al Yousuf Motors we are dedicated to delivering the highest levels of customer satisfaction through our innovative product range and customer experience,” he said. “The brand is in a strong position to build its presence in the Middle East market and we are looking forward to a fruitful and extensive partnership. The MG brand will be an extension of our automobile sector and services which will continue to bring success to the group at a local and regional level,” he said. Committed to offering customers the highest levels of customer service, MG offers a six-year/200,000km warranty. To ensure MG Motor’s unrivalled aftersales service is maintained during the transition period, existing customers of MG Motor will be able to visit AW Rostamani trading for their servicing needs up until August 2018, it said.